Sumo is an ancient Japanese tradition and martial art and it’s coming to San Francisco at this one-of-a-kind annual event in Japantown. 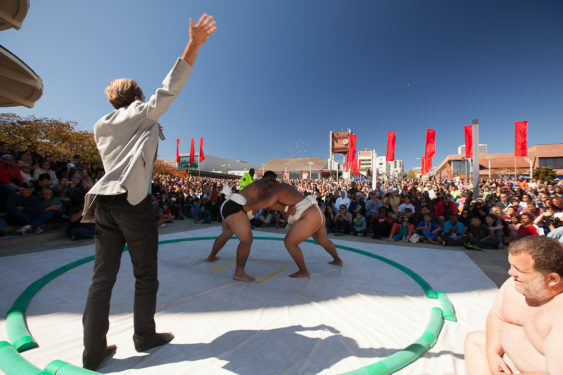 Watch demonstrations, meet real sumo wrestlers, learn about sumo wrestling and watch actual matches from Sumo champions, weighing up to 600 lbs, outdoors in the Japantown Peace Plaza. Byamba, 6’1″, 370 lbs, Mongolian, three-time World Sumo Champion, just astounding, off-the-charts charisma and Sumo athleticism.